The ultimate must-have for any medical professional. Multiple storage pockets and compartments designed specifically for the tools of your profession, including document area and padded laptop compartment. Large hinged mouth opens to a roomy interior. 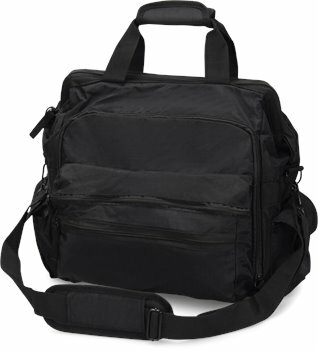 Includes shoulder strap, padded back and non-skid bottom. Measures 13” x 9” x 14”. I bought this bag about a year ago and absolutely love it. I call it my "Mayr Poppins" bag because anything I need is in this bag. I have been an RN / Paramedic for over 30 years currently working on a Tele floor and am accustomed to carrying all the tools I anticipate needing for a shift. I cannot tell you how many times a co-worker has come to me for a tool they need and I always seem to have it in my magic bag. There is a pocket inside for file folders perfect foe holding charts for teaching and drip rate charts for all the meds we use and even my iPad. I see nurses carrying work bags and lunch bags but in addition to the tools of my trade there is still room in here for my lunch and even an extra uniform. I have been so pleased with this bag that I am purchasing one for a co-worker who is leaving to go to another floor. It is very roomy and functional. The extra pockets are useful and I consider this a great everyday bag for work. This bag is fantastic. It really helps me stay organized and not have to bring too many other totes. Nice durable fabric zippers are alittle flimsier then I expected. Also I wish the shoulder strap was more durable. Best nursing bag I have ever owned. Just enough room for everything and I will order again. This is my second. I also have a pink one. Now I need one with stripes. I like the bag and it was shipped very expeditiously. The nursing tote bag is quite wonderful. A lot of littel storage pockets and a few nice spacious pockets for folders and books. Recieved the bag in a timely manner and love the free shipping. Very stylish and lots of pockets for all my equipment. I am a home care nurse in the Ozarks and this bag holds a lot of stuff for my home visits. It is too big for me to expect. But I can use it for more items. It is a good bag for me. This nurses’’ bag is perfect. Plenty of compartments for a busy nurse plus easy to haul around. Easy to get into. Wonderful bag. Perfect size - big enough but not too big. Convenient pockets and pouches. I bought another one for a colleague’’s birthday gift. Very nice bag - well made and spacious. I am not a nurse but actually bought it to carry Mary Kay products since their main color is pink - it’’s perfect So this item is also very versatile. delivery was within one week. product is of excellent quality. several people have asked me where i purchased it and i was happy to recommend shoeline.com. I wish the frame of the bag was a little larger it would allow for things to fit in a little easier but the bag itself is great. The color is more pink and black than just pink. Really nice bag I love how durable it is. Very practical as well as stylish. This was a gift for my wife. She has been very impressed by it thus far. She says it holds everything she needs and has held up very well so far. This bag is great for carrying all the things I need to take to the office. I really like the section with the padded pocket to protect my stethoscope and other delicate items that I need for work. This bag is huge. Everything I need for work and then some fits well. Has so many separate compartments hard to remember at times where to look for different tools- well worth the money. Was going to purchase this item from another online vendor but found your "no shipping no tax" offer and decided to go with that. The box came damaged but the contents were fine and as ordered. Would purchase again from this company. Thank you. I bought the nurisng bag by Nurse Mates. I love it. As a student in clinical rotations I am able to carry all the things I need. I am so pleased with this product. So much so that it will become my standard gift for all of my nurse friends. I promptly received my order as promised. It was so easy to order from the website that I will do it again. I purchased a nursing bag. I LOVE it. Several of the other nursing students in my class will be ordering this week. I also bought one for my daughter.